Over 50+ volunteers help to staff the research exhibits that provided hands-on interactive science in program areas such as infectious disease modeling, clinical studies, regenerative medicine and biomedical engineering. The activities included: “Growing Hearts in a Dish,” “Infectious Diseases and One Health,” “Yard Monsters: Invisible Parasites,” “No Guts, No Glory,” “Drugs for Bugs,” “Gels for Cells,” “Green Eggs and Green Ham,” Yikes…Is My Chicken Nugget Alive?” “Sound of Music…for Cells,” and “Disease Detectives.” The Graduate Student Association members were also present to share information on career opportunities. The CMI presence at the Open House reached beyond the Research Building as the Clinical Studies Core located in the Firestone Hallway of the College of Veterinary Medicine building included activity for children that highlighted the scientific method utilizing dry ice and soap bubbles! 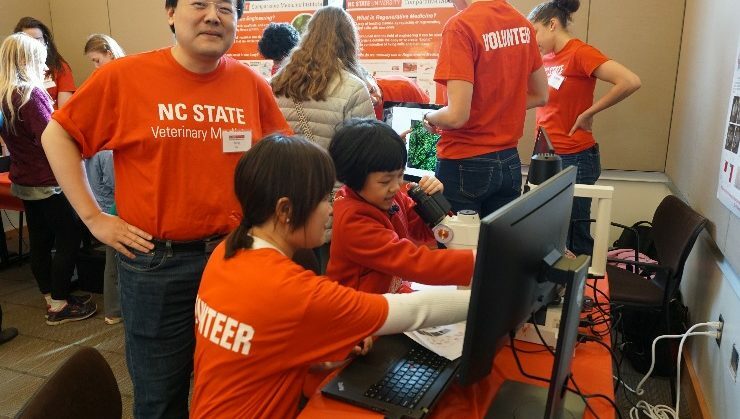 This annual college outreach opportunity has allowed the CMI and CVM research to display human and animal health through exhibits that allow for visitors of all ages to participate in activities that will encourage interest and involvement in science and research.